... yes, I know the language is inappropriate, but it's true. I will do ridiculous things for frequent flier miles. I am a member of two programs. 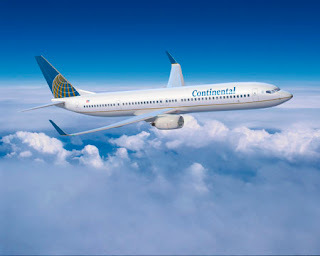 Continental Airline's frequent flier and United Airline's. Continental is attached to my bank card, so for every dollar I spend on the card, I get a mile. Awesome. They also e-mail me other offers, like "change my electrical provider and get 3,500 miles" which also helped, because the electrical provider was 1) cheaper than NiMo, 2) local, and 3) offered a green energy option. Again, awesome. Continental has sent me on 3 free flights in the past 7 years. I <3 them long time. These programs both allow you to earn frequent flier miles without purchasing anything or really doing much at all. E-miles has you look at offers and gives you 5 frequent flier miles for every offer you look at (you don't have to buy any of the offers or sign up for anything, but if you do, you get MORE miles) and E-rewards give you money/miles for filling out surveys, none of which have taken me any longer than 8 minutes. And both programs partner with more than just Continental. I have earned 750 flier miles from E-miles and 1,000 from E-rewards already. With United, I am only a member, because I am a member of mypoints.com, where I can redeem my points for miles with United, which I then either sell on e-bay or trade with someone who wants those for Continental on any number of various trading sites. I am sharing this information with the hope that some of y'all might know of other survey/offer/what have you programs out there where I can pick up more frequent flier miles. I blame the crazy snow storm and all your photos thereof for making me stir crazy and feeling a need to fly off to various and sundry locations. But seriously to have earned 1,750 miles through two programs which eat up no more than 1/2 hour of my week... I want to know if anything else is out there, cause I will sign my tuckus up! You know, a frequent flyer mile is worth about 1c or less -- so they're only paying you 5c to look at each offer; less than they'd be paying to advertise the offers somewhere like Google. It's also a pretty slow way to accumulate points!